ENTER STAGE LEFT-Rowan Townsend, a twenty-nine year old Broadway starlet, strolls onto the dark, ominous stage. The bright spotlight finds her and she smiles broadly, her body buzzing in anticipation. Serendipity is a funny thing, isn’t it? It jumps out from behind the bushes and offers an unbelievable chance at happiness. It’s hopeful and intriguing, and maybe even a little terrifying. ENTER STAGE RIGHT-Lark Hawthorne, a striking twenty-nine year old FBI agent and self-proclaimed liar, marches to Rowan and grabs her arm, coaxing her off stage. Rowan, what are you doing? We need to leave. It’s not safe here. Rowan and Lark look out into the audience and a menacing shadow in the back of the theater catches their attention. Her eyes expand in panic and he grips her hand tighter, offering reassurance. It’s now or never. Are you ready? 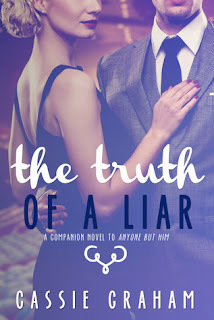 Review: This is a sequel of sorts (maybe more of a companion book) to 'Anyone But Him' and while I did not enjoy that book, this was much better. Set a few years after the first book, Lark (Whitley's ex-boyfriend) is now an FBI agent assigned to rising Broadway star, Rowan. They have a history together, but Lark doesn't recognize her from their high school days. There was a threat involving human trafficking which was slightly ridiculous, but I liked the relationship between Lark and Rowan and found them somewhat believable.